New and improved with 6 LEDs for each meter! Provides more even illumination than the original 4 LED version and the original PL17 incandescent version provided by Phase Linear. This is the premier Phase Linear PL 700B LED Lightboard upgrade kit on the web. It is a professional-class upgrade product, meticulously engineered to look and perform better than the original. Do you own a Phase Linear 700B Amplifier (the one with the 2 big VU meters)? It is a great amplifier but maintaining the original incandescent meter light bulbs that frequently burn out can be a real nuisance. Here is your opportunity to replace the original light board with a high-quality, long-life LED powered replacement. You will also notice that those cheap paper light baffles that were on the original PL17 board are gone too! This kit includes a brand new, upgrade blank PCB kit to replace the original incandescent light bulb board (PL17) with a long life, low power, LED based board assembly. This kit includes the bare board and all electronic components shown in the photo above and the link to the "crystal clear" assembly instructions and documentation. The components in the kit will be pre-formed for you as shown in the photo above. The components you receive in the kit may differ slightly in appearance from those in the picture above due to parts manufacturer changes. There are 6 ultra-bright, wide dispersion Blue (or White) LEDs for each meter providing a consistent wash of light for meter illumination. You can choose either white or blue LEDs for your application depending on which LEDs you populate (blue LED part numbers are specified in the instruction parts list but you can request equivalent white LEDs at the time you order). The LEDs are powered with a forward current of 18mA to provide bright, pleasing illumination while reducing the power requirements by over 80% from the original board. A current control resistor is provided for each LED allowing you to tweak with the illumination level if desired. 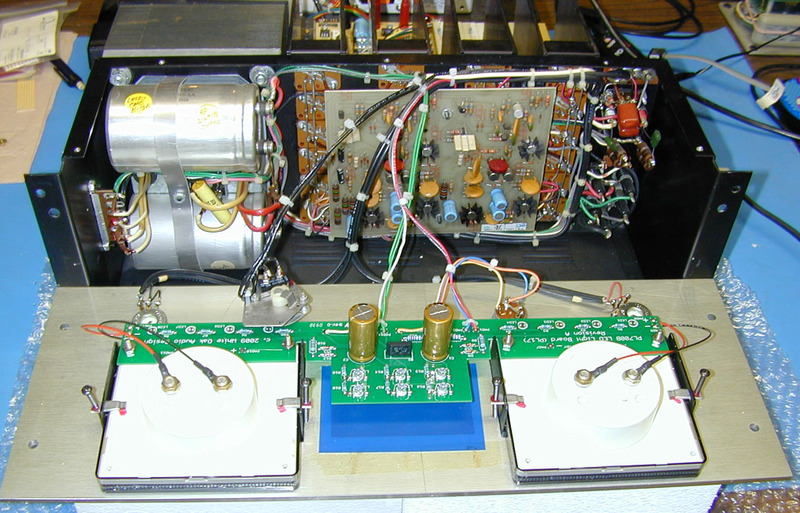 A bridge rectifier is located in the center of the board surrounded on the left and right with 2 filter capacitors. This combination provides a smooth, flicker-free DC source for the LEDs. The cool running LEDs eliminate the heat associated with the original equipment incandescent bulbs and last indefinitely. No more replacing those hard to find bulbs and no more discoloration of the meter plastic due to the excessive heat from the incandescent bulbs!! The printed circuit board is a high quality FR-4 based, epoxy-glass PCB with HASL tin/lead plating on the solder pad areas replacing the cheap original single sided PL-17 PCB. The replacement PCB is 0.062 inch thick double sided circuit board with plated through holes and white epoxy silkscreen legending on the component side and green solder mask on both sides. It is a direct drop in for the original board size, using the original mounting hardware to secure it in the amplifier. This replacement board includes holes to secure and strain relieve the amplifier wire connections to the LED Light board. This feature can be seen pictured in the photos. The original PL17 wire attachment points would often separate from the PCB, ruining the board. This upgrade kit is for skilled technicians. While building and installation is not a difficult procedure, the installer should be familiar and comfortable with working on electronic equipment and using a soldering station and associated tools. Ensure good control of soldering iron temperature, not exceeding 600 degrees F, so the LED Light Board is not ruined by excessive heat. If you are not familiar with working on electronic equipment or do not possess the proper equipment, it is recommended that you take your amplifier to a service technician that can perform the LED Light Board Upgrade and installation for you. Bare board only kits as well as assembled and tested versions of this LED light board are available as well on the White Oak eStore. Photos of the finished project are shown below (installed in chassis, installed in chassis (oblique view), front view with BLUE LEDs, component side of the finished assembly (2 views), solder side of the finished assembly). This kit is sold AS-NEW with no returns (due to potential damage to the circuit board during the assembly process). White Oak Audio will pay USPS first class mail shipping charges (but not insurance) within the continental 48 US states. If you require other than first class mail, buyer will be responsible for shipping charges by method selected on the shipping weight stated above. If you do not pay for shipping insurance, delivery will be made totally at buyer's risk for loss and damage. Your purchase will be professionally and neatly packaged for shipment in bubble wrap within a sturdy, 3" diameter mailing tube. International orders are also welcome, shipping charges are not included to international destinations (contact us for a shipping quote to your destination).